Cut the fish in bite size chunks and sautée lightly while adding the chopped onion and serranos. Once the onion is translucent, add the garlic, one minute after, add the tomato. Salt to taste and remove from fire after the tomatoes are cooked. All cooking should be around 10 minutes. 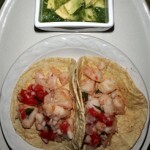 Serve over warm tortillas and dress with the green salsa. Using the “pulse” button in your blender or food processor mix the tomatillos, onion, serranos, half of the avocado and half of the cilantro to a rough texture. We want to imitate a rustic salsa out of a molcajete. Place the mix on a bowl. Cut the rest of the avocado into small cubes and rough chop the cilantro, and throw both on top of the salsa.